Please find below a list of local Perth hotels. (All times quoted are for walking distance). The hotel is just a short walk from the area's shopping, entertainment and business districts and features 2 superb restaurants, one entertaining bar, swimming pool and gymnasium. Combination of friendly service and attention to detail with unparalleled inner-city luxury and is conveniently located across the road from the Perth Convention and Exhibition Centre. Minutes to Perth's main shopping mall. Kitchenette facility in every room with Cook top, microwave oven and full cooking equipment, restaurant, room service and 24 hour reception. 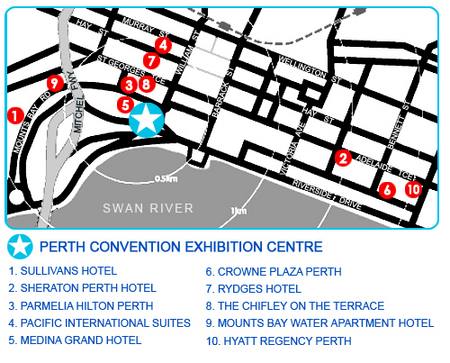 Conveniently located at the Perth Convention and Exhibition Centre. Apartments are serviced daily and include full kitchen, separate lounge and laundry facilities as well as a restaurant, pool, gymnasium, spa and sauna. Located across from the river with all facilities that you would expect from a Crowne hotel. Centrally located in downtown Perth adjacent to the West End entertainment and retail areas. Superior rooms consist of either one queen size bed or two double beds. Complimentary access for guests to off-site Health Centre - pool, gym, spa & sauna (adjacent to the property). A short stroll from the venue and includes 24 hour reception and room service. Set in a village style environment complimented by gardens, swimming pools and tennis courts. Limited rooms are available at each hotel and we recommend that accommodation be booked early.